The exhibition Color Moves: Art and Fashion by Sonia Delaunay, at the Copper-Hewitt National Design Museum which opens March 18th, will center “on fashion designs from her own Atelier Simultané in Paris during the 1920s, as well as textiles designed for the Metz & Co. department store in Amsterdam in the 1930s. On view will be examples of designs, textiles, garments and photographs” from French Museums and American and European private collections. 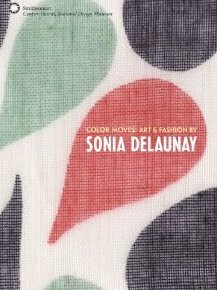 ” Known primarily as an abstract painter and colorist, Sonia Delaunay applied her talents and theories to all areas of visual expression, including graphics, interiors, theater and film, fashion and textiles. A trademark of Delaunay’s work is the sense of movement and rhythm created by the simultaneous contrasts of certain colors. “[from the Cooper-Hewitt website] I personally find Delaunay to be a fascinating artist and designer, and I wrote about her here. Special Collections and FIT Archives holds a collection of her sketches which you can see here. Although her work was featured in several exhibitions, especially in Europe, not many design students know and recognize her contribution to the field. Hopefully the exhibition at the Copper-Hewitt will expose her work to a broader audience. You can also read this interesting related post from Sarah Scaturro, a graduate of our program who works at the Cooper-Hewitt. 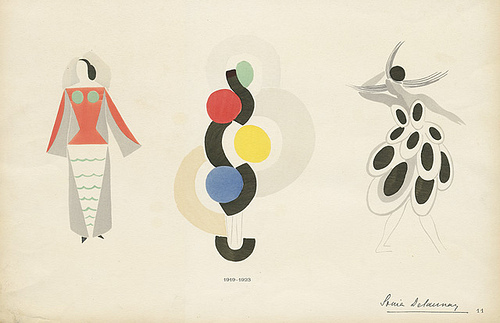 This entry was posted in Exhibition and tagged Cooper-Hewitt National Design Museum, Sonia Delaunay. Bookmark the permalink.